Rev. 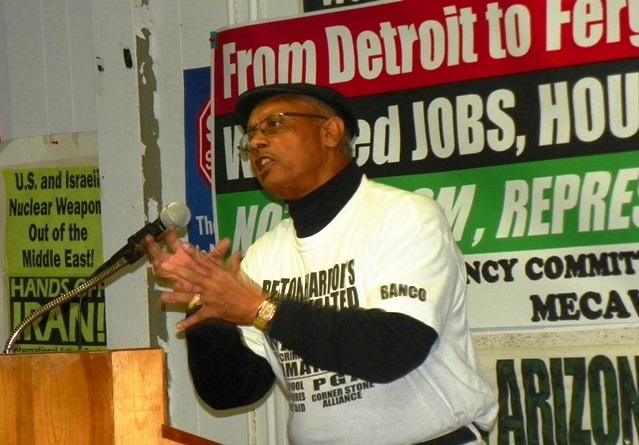 Edward Pinkney of Benton Harbor speaks in Detroit Nov. 17, 2014. For a lesson in bigotry, lies and sheer negativity, you could try the Berrien County courthouse in St. Joseph, Michigan. I wouldn’t recommend it, though. Since 2006, I’ve been a witness there to many of the legal battles forced on Rev. Edward Pinkney and it has worn me thin. The town of St. Joe itself is a little backward, to put it mildly. (Think movie town Pleasantville before the color change.) Residents of the almost all-white city seem to carry a perverse pride in how well they’ve barricaded themselves from the mostly Black folks across the river. 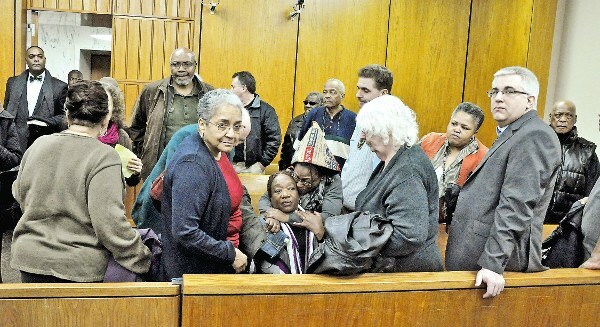 Although court observing is never fun, here it seems worse. In addition to the hard benches and infinite rules (no book reading, for instance) court observers are subject to numerous other assaults—on your intelligence, conscience and dignity, to name a few. There seems to be an Alice in Wonderland-like logic that accompanies Pinkney hearings. Visitors tend to react in turns with puzzlement, amusement, anger, terror or frustration. Myself, I’ve taken to clutching my stomach and hightailing it out of there just as soon as the proceedings are over. A close friend of his can’t even bear to attend Pinkney hearings anymore. She wants to support him but has a hard time watching the relentless assault on this African-American minister who is more than a little like Martin Luther King, Jr.
Rev. Pinkney leads march against 2006 frame-up, which ended with a hung jury; state brought it to trial again with a all-white jury, obtaining conviction. Always ready to challenge unfairness, Edward Pinkney has been fighting the legal system hard-core since 2000, after what could arguably be called his first political imprisonment. It was an insurance fraud case involving the paltry sum of $123, which begs the question of why it was brought to court in the first place. Pinkney served time, but used it to go within and make a life change, emerging from prison an ordained minister. Since then, he has been an almost daily presence at the Berrien County courthouse, either leading protests outside or monitoring individual cases inside. He turned to the election system in 2005, spearheading a successful recall campaign against local councilman Glen Yarbrough, only to have the victory crushed a week later by a judge with an iron fist. To back up the judge’s decision, the city clerk, an impeccable woman named Jean Nesbitt, was fired. 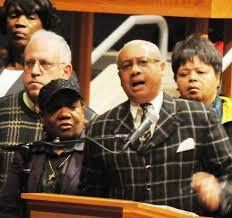 Then the State went after Pinkney. They charged him with possessing another’s absentee ballot, which, believe it or not, is a felony crime with a penalty of up to five years in prison. (I did an informal survey of fifty or so people in Kalamazoo in 2006; more than half didn’t know possessing another’s absentee ballot is a crime, much less a felony.) Prosecutors claimed Pinkney touched five of the ballots, pumping up the penalty times five. Rev. Pinkney with his wife Dorothy at his side, speaking at first rally against PA 4, the predecessor to current PA 436, in Detroit, in 2011. Of course, no actual evidence (like fingerprints) was ever offered when Pinkney was taken to court in 2006. In fact, the three week “trial” seemed entirely composed of smoke, mirrors and lies. The prosecutor spent two full days of court time poring over Pinkney’s phone records, especially calls to the city clerk. The implication was that he and the clerk had somehow cooked something up, though it was never made clear what they were supposed to have done. The prosecutor spent two more days examining the applications for absentee ballots, which was a smoke screen since they had no bearing on the case. In addition, the State’s star witness was a woman with a known crack cocaine problem who kept contradicting herself. None of this seemed to bother ten of the jurors, who voted to convict the reverend. Two held out, though, and the end result was a hung jury. Rev. 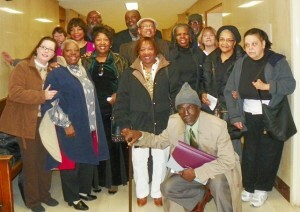 Pinkney, with wife Dorothy in front, is supported in his Detroit court battle to retain leadership of Benton Harbor NAACP. Normally, this is as far as the State takes it, but prosecutors brought Pinkney to trial again in 2007, this time securing an all-white jury and, therefore, the conviction. The reverend was put on a tether at first, then wrote an article slamming the judge, and was sent to prison for it in 2008. Seeing this major slap in the face of the Bill of Rights, the ACLU got involved, fought the good fight, and got the reverend out of prison on appeal the following year. Rev. Pinkney returned to his rigorous schedule of court-watching, attending meetings, leading rallies, making speeches and taking numerous phone calls. He served for a few years as president of the local NAACP chapter though he later broke ties with the organization, citing them as ineffective. He pushed hard for a city income tax that would place some of the burden on wealthier Whirlpool employees and shore up the city’s economy. Rev. 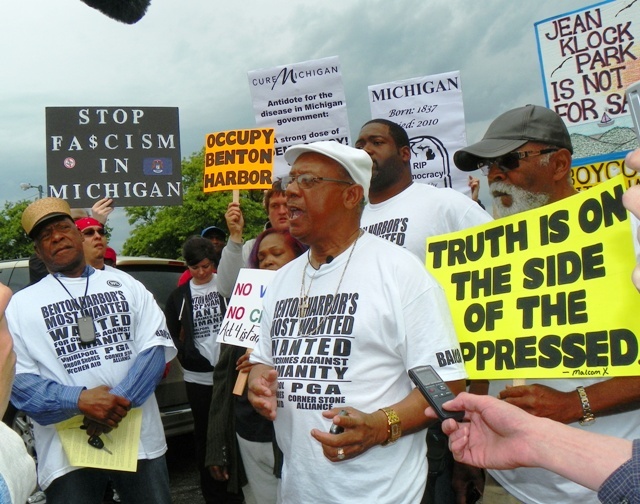 Pinkney led anti-emergency manager protest in Benton Harbor May 26, 2012, calling for BOYCOTT OF WHIRLPOOL CORPORATION, the city’s overseer. 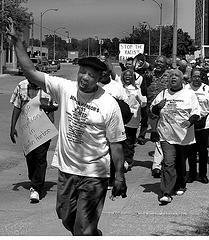 One of the more outspoken opponents of the tax was the mayor of Benton Harbor, James Hightower. Pinkney saw Hightower’s actions as not being in the best interest of city residents and became part of an effort to recall the mayor. Many of us have circulated petitions; it’s not uncommon to dot an “I” or cross a “t”, when necessary. We might even have to correct a date or fill in a blank to make the signature valid. I know I have. 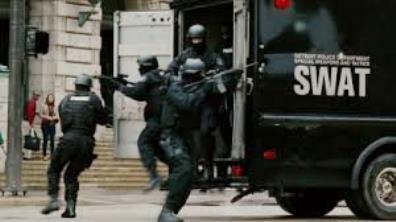 Police SWAT team invades home. Imagine a police swat team coming to arrest you because there were a few of the aforementioned discrepancies. Imagine further that the government pins a forgery charge on you (times five) and makes it stick to the tune of two-and-a-half to ten years in prison. That’s exactly what happened in the case of Rev. Edward Pinkney. To convict the reverend, the judge and jury had to ignore the fact that with all of Pinkney’s election experience, he wasn’t likely to be responsible for this mistake. Also, there was that troublesome lack of evidence tying the reverend to the “crime”. Finally, the judge had to ignore the fine print on every petition that states that alterers can be charged with a misdemeanor (only) punishable by a fine and/or up to 90 days in jail. That’s a far cry from what Rev. Pinkney got. Pinkney juror Gail Freehling knew Berrien County Clerk, Sheriff, others involved in prosecution, lied about it. If all this goofiness doesn’t show the cracks in Berrien County’s justice system, I don’t know what does. Add to that Pinkney’s insistence that he didn’t make any changes and three witnesses testifying that another person changed several dates, and this starts to look like a strategic attack on a politically active American. Welcome to the Berrien County court system, where fiction is as good as fact, as long as you have the arrogance and paperwork to back it up. In some cases, like Rev. Pinkney’s, you don’t even need the paperwork. An evidentiary hearing will be held on April 14th to decide whether one of the jurors [Gail Freewas biased by her friendship with the county clerk. 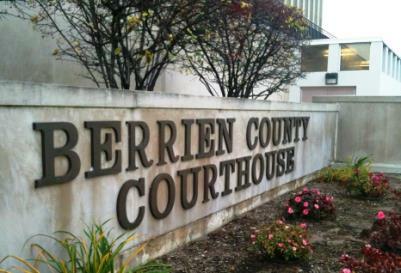 It begins at 8:30 a.m. in the Berrien County courthouse. It should be an interesting showcase of how our system treats a political prisoner. Maybe I’ll see you there—if you think you can stomach it. PLEASE COME TO HEARING AT BERRIEN COUNTY COURTHOUSE TUESDAY, APRIL 14, 2015, 8:30 AM. In Detroit, Marcina Cole is coordinating carpools, to leave from the Moratorium NOW! office at 5920 Second Avenue at 4 a.m. Protests to be held at court before and after hearing, bring signs. For further info, contact Marcina Cole, 248-383-3595. SUPPORTERS NEED TO RAISE $20,000 FOR REV. PINKNEY’s APPEAL. Go to page for the Benton Harbor Black Autonomy Network Community Organization, BANCO, at http://www.bhbanco.org and hit Donate button. 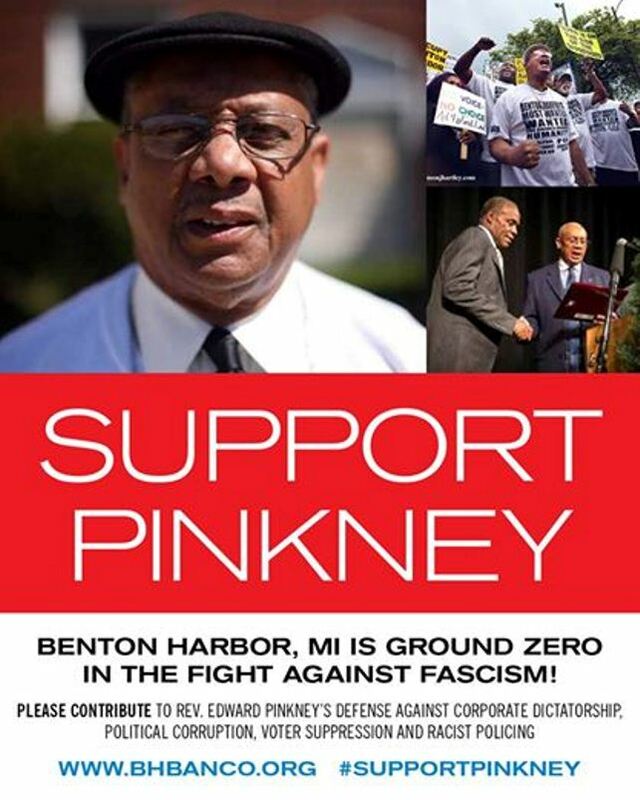 Donations can also be sent (checks made out to BANCO) to Mrs. Dorothy Pinkney, 1940 Union Street, Benton Harbor, MI 49022.